It's almost Christmas so despite not being entire sure that the post office has actually delivered our cards this year, I'm going to blog share now. 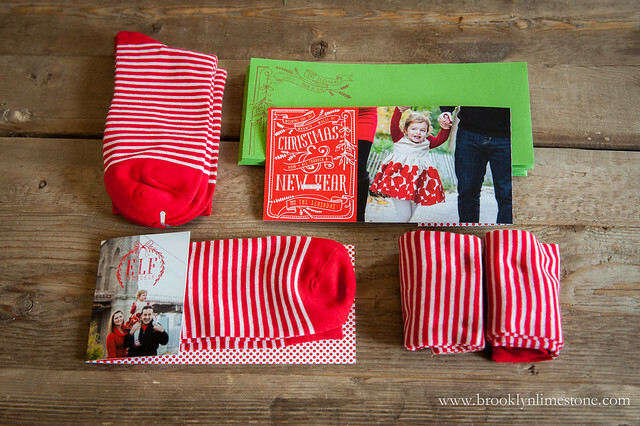 This year's little treat was a pair of red and white striped socks perfect to elf yourself. Who couldn't use a fun pair of socks? Wishing all of you the warmth and magic of the holidays this year! 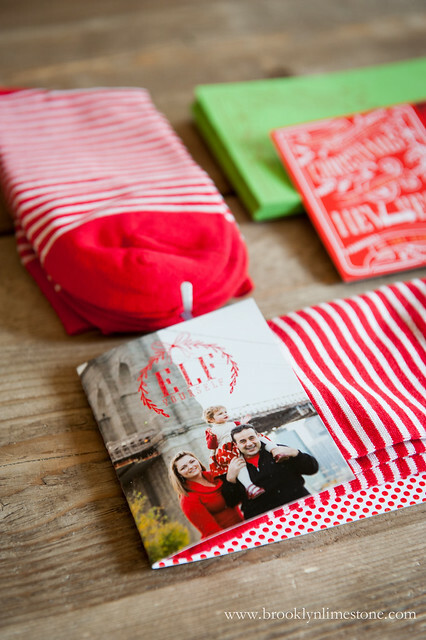 ps: Our holiday photos were taken by the lovely Kayla Poole who also blogs at exquisite banana. Want more? 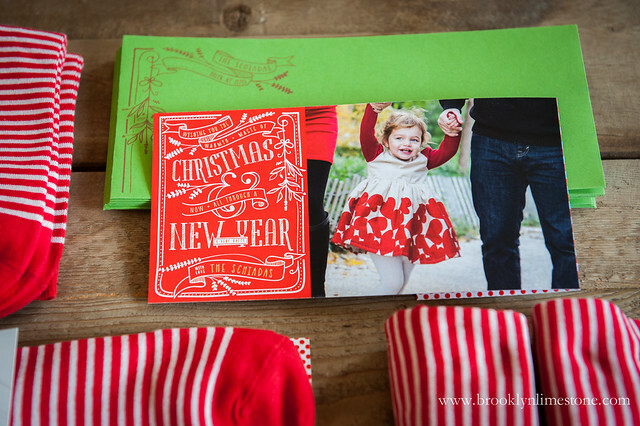 Prior years' Christmas mail have included metallic markers (for a remarkable year), cinnamon (seasonings greetings), mints (merrymint! 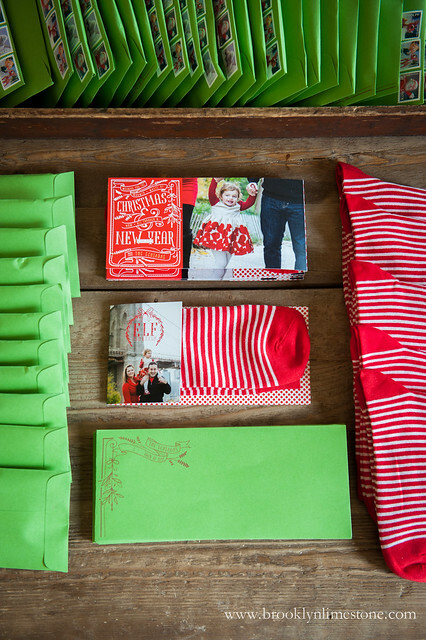 ), chapstick (mistletoe ready), tea towels (for a fresh start), bookplates, cards, lottery tickets and cds. I have absolutely no idea what I'll do next year (I usually have something in mind a year out) - good thing I have plenty of time to figure it out. Wow, I love the card! You always have the most creative cards. This is such a great idea! I don't think I picked up on your gift+card before.... So so clever! And I'd love the socks, no matter when they were delivered! Such generous, happy, and festive mail! The recipients must love you! Oh, this is adorable! I am a sock junkie, and would love to get something like this in the mail! You always have the BEST ideas! Merry Christmas, and thank you so much for all the amazing ideas all through the year. So cute! So funny, I think last year's Xmas card post was the first one I read. Love your blog! Fantastic lovely card.This application is extremely captivating, and I utilize it each Christmas when I host a family Christmas gathering. Notwithstanding, I wasn't thinking and deleted it a year ago. I'm attempting to include it as an application again in light of the fact that the yearly Christmas party is today, yet the application won't download. It is stuck on holding up, and it won't move any more distant than that. Thanks all!